While it is modest and simple like all mission furniture, the Amish Modesto Mission Bench is truly a shining star! Featured in Old House Journal Magazine in August 2015, this mission bench was noted as "a must have for modern foyers and mudrooms!" The richness and luxury of the solid wood you select is showcased in the panels and form of this mission bench. The attractive bench legs are flared slightly to create stylish shapes. Let the Amish Modesto Mission Bench provide a designated space for family to set and store backpacks, purses, outerwear, hats and shoes. 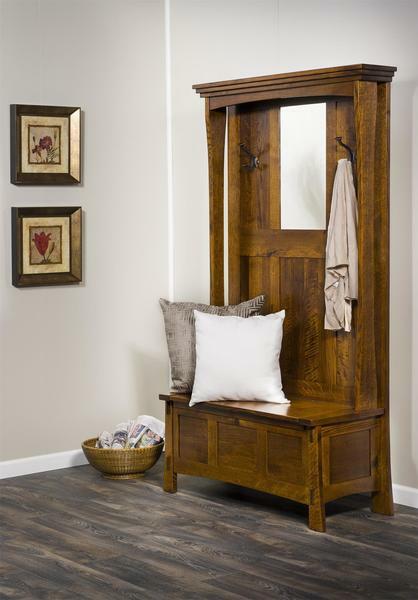 Makeover your foyer or mudroom with this Amish made mission bench. This multi-functional furniture offers a stylish seat and storage all in one! This mission bench comes complete with a convenient mirror to use as you come and go. Bench seat lid has one soft close lid support that closes gently and slowly, never slamming or crunching fingers. Mirror Size: 11 1/2" x 21 3/4"
We love our new hall bench!! It is beautiful and wonderfully made! !